Fingerboard sign south of Hay, January 2004. National Route 75 is a rather remote and useless north-south route through outback NSW. 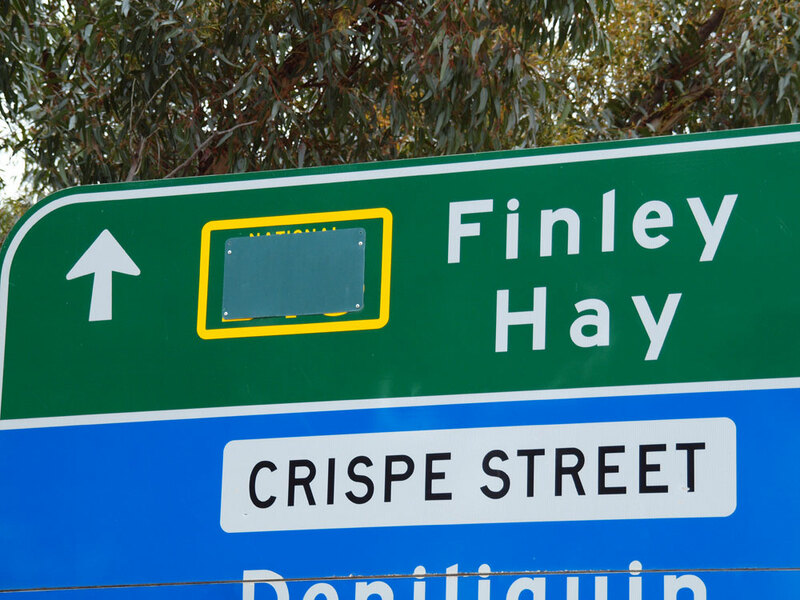 Currently it is only signposted between Moama and Hay, with a large chunk north of Hay being unsealed and the Victorians having adopted alpha-numeric numbering a few years back. The route is named the Cobb Highway. 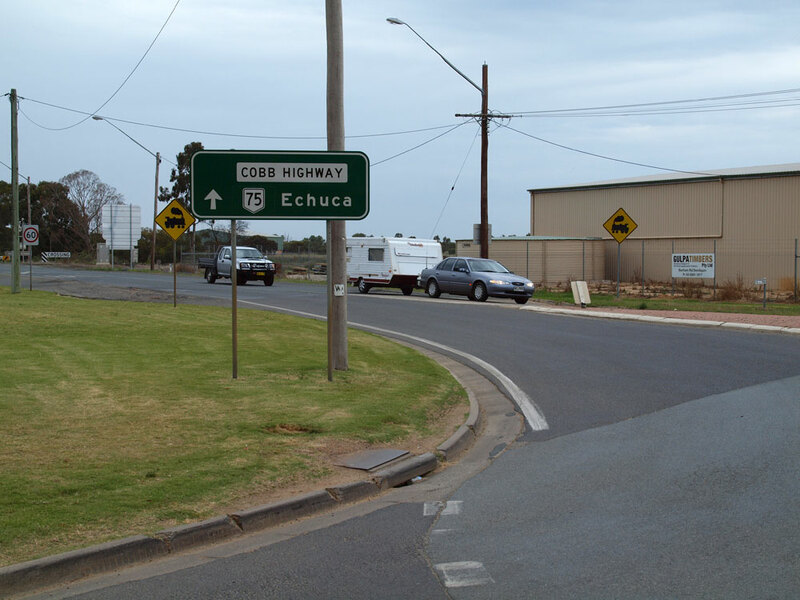 The Cobb Highway was proclaimed State Highway 21 in the 1930s and this proclamation extended the current route north through Wilcannia, White Cliffs and Tibooburra to Warri Gate at the QLD Border. 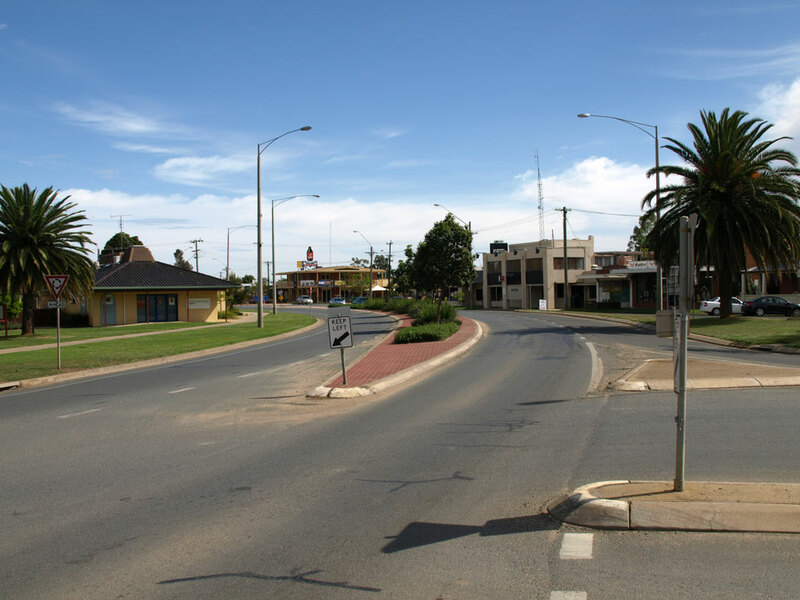 The highway was truncated south of Wilcannia on 9 February 1945 when the Silver City Highway was proclaimed. The Cobb Highway recieved its name in 1947 after the Cobb & Co. coach company which serviced the area throughout the 19th century. 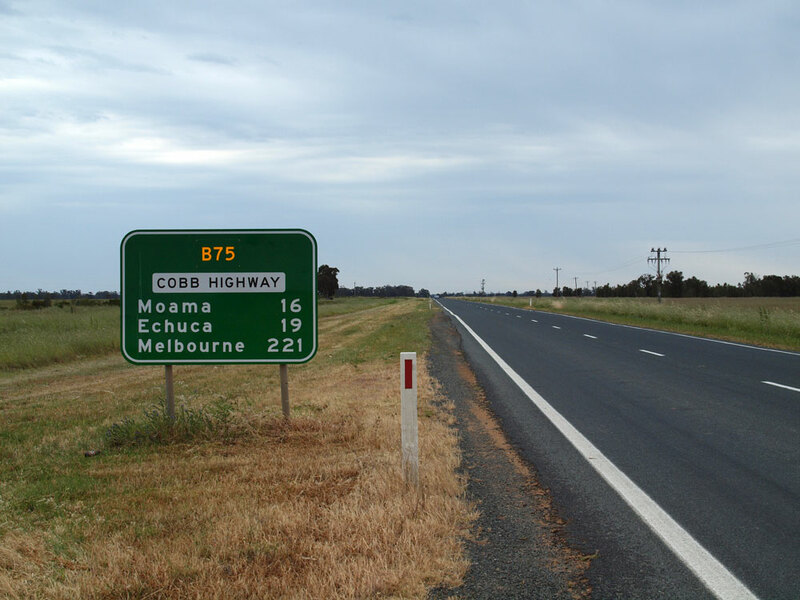 In 1954 at the dawn of the National Route system, the Cobb Hwy in NSW and the Northern Hwy in Victoria were designated to be National Route 75, however at the time much of the route was still unsealed within NSW. 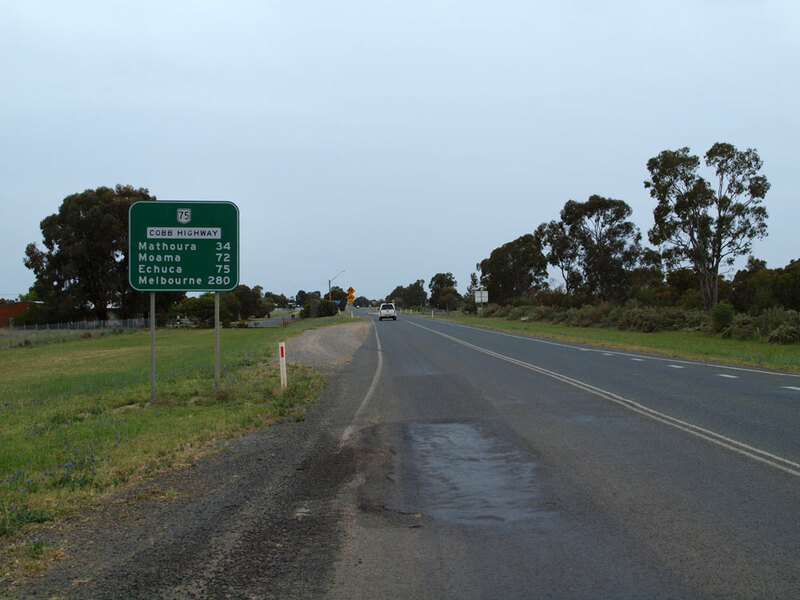 In 1958, NR75 was signposted between Kilmore (where it met the Hume Hwy) and Hay, which was all sealed road. To this day, the highway north of Hay has not been sealed and therefore hasn't had the NR75 designation signposted. It seems with the imminent conversion to alpha-numeric numbering in NSW that NR75 will never be fully signposted. 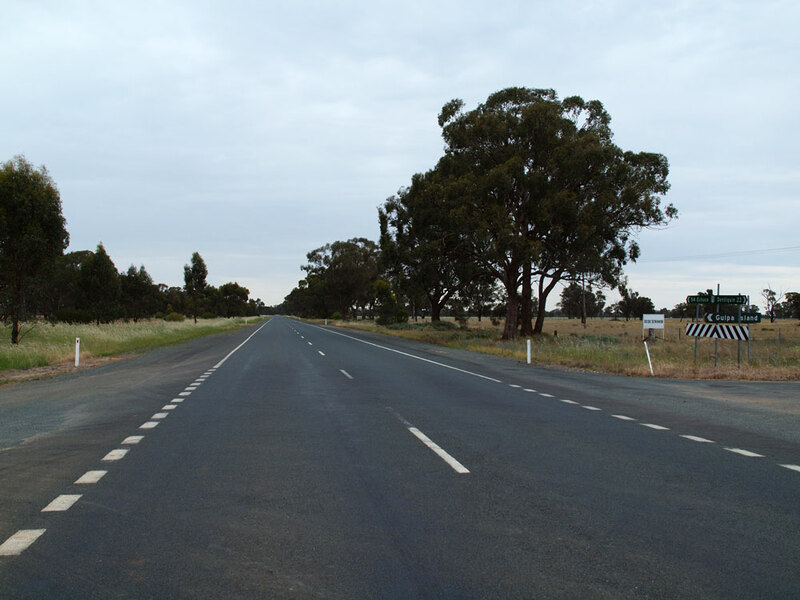 In 1998/99, the Northern Hwy was re-badged as B75 throughout Victoria, leaving the route rather remote and useless between Moama and Hay. Extremely old 1960's National Route 75 trailblazer, found on Barrack St at the Northern Hwy in Heathcote. This section was re-badged the B75 in 1999. Photo taken by Viseth Uch in September 2004. Very old 1958 original trilblazer on an old alignment of NR75 in Echuca. The old alignment is Annesley St and was bypassed by the B75 in 1999. Thanks to Philip Peng for telling me about this sign. Jan 2005. Looking north across the Murray River bridge at Echuca. This is the southern terminus of NR75. Photo taken January 2004. Looking south across the Murray River bridge at Echuca. 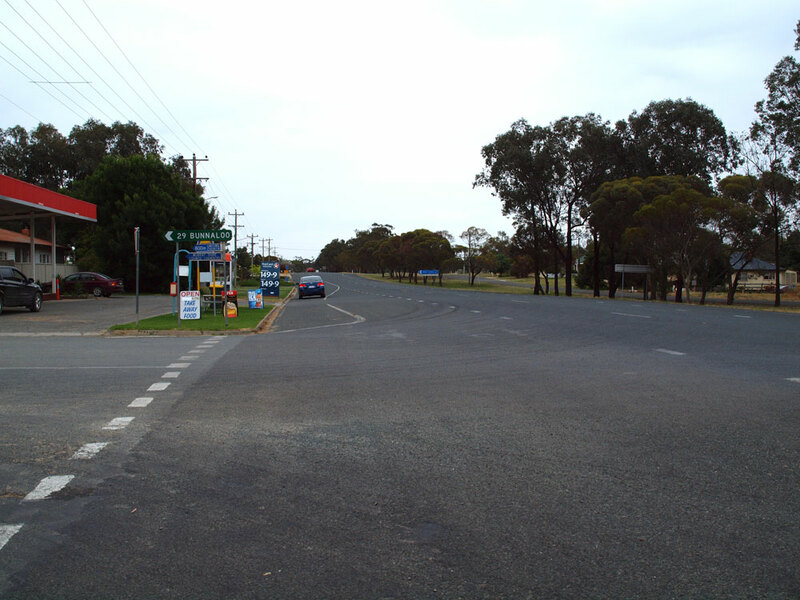 This is the southern terminus of NR75, continuing south into Victoria as the B75-Northern Hwy. Photo taken January 2004. Black ID sign at Shaw St, Moama. Photo taken January 2004. Cobb Highway (Meninya Street) looking north from the junction with Shaw Street, Moama. Source: Peter Renshaw, October 2010. Looking north through Moama. Jan 2005. AD sign northbound on Cobb Highway approching the junction with Perricoota Road, Moama. Note the lower panel should have a blue background as 'Clubs' is a service. Source: Peter Renshaw, October 2011. AD sign eastbound on Perricoota Road approaching the junction with Cobb Highway, Moama. Note the peeling black lettering, a feature common to signs of this era (approx 1998-2001) in south western NSW. RD sign heading north on Cobb Highway at Moama. Note the non-standard supplementary plate for Barmah Forest which is no longer signed at the Barmah turnoff. Cobb Highway looking south towards the junction with Nicholas Road, Moama. 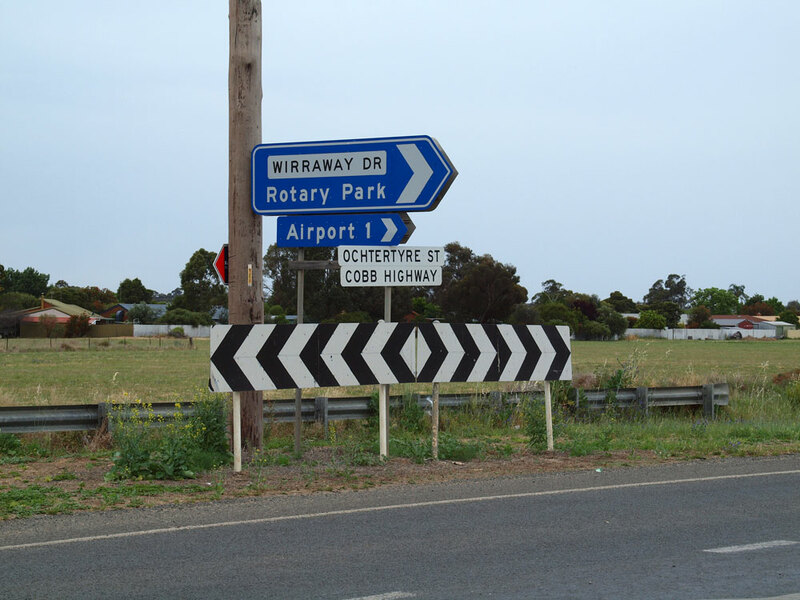 RD sign southbound on Cobb Highway at the junction with Barmah Road, 16km north of Moama. Note the dodgy 'B75' route marker rather than NR75. AD sign northbound on Cobb Highway approaching the junction with Barmah Road, 16km north of Moama. 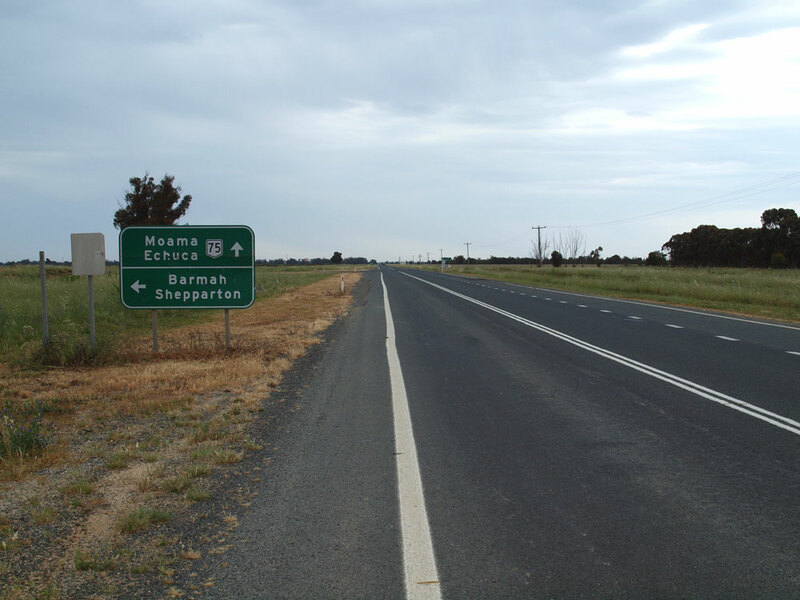 AD sign westbound on Barmah Road approaching the junction with Cobb Highway, 16km north of Moama. ID sign assembly at the junction of Cobb Highway & Barmah Road, 16km north of Moama. 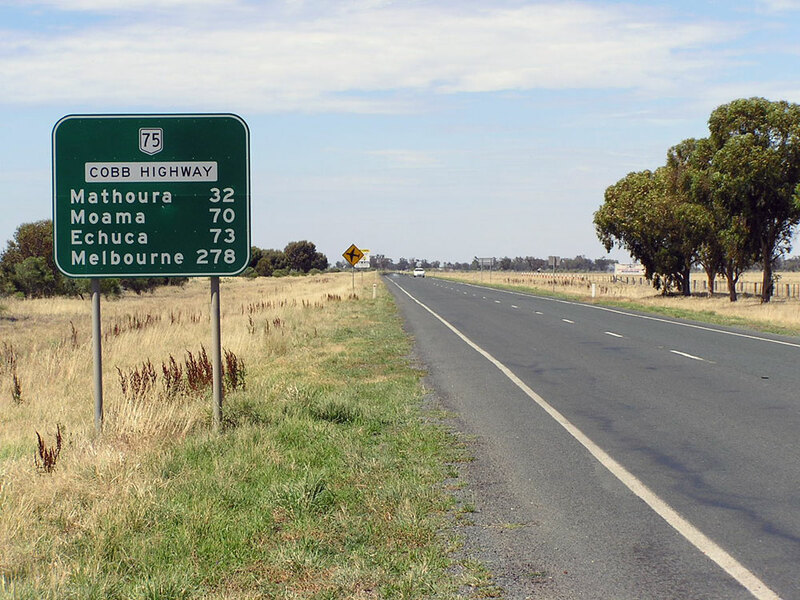 AD sign southbound on Cobb Highway approaching the junction with Barmah Road, 16km north of Moama. RD sign northbound on Cobb Highway after the junction with Barmah Road, 16km noth of Moama. 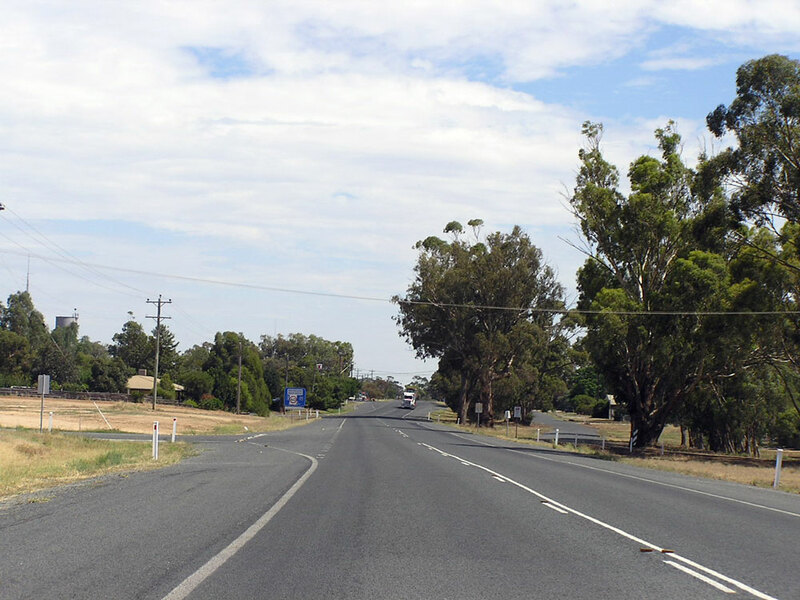 Cobb Highway looking north through the township of Mathoura, 37km north of Moama. 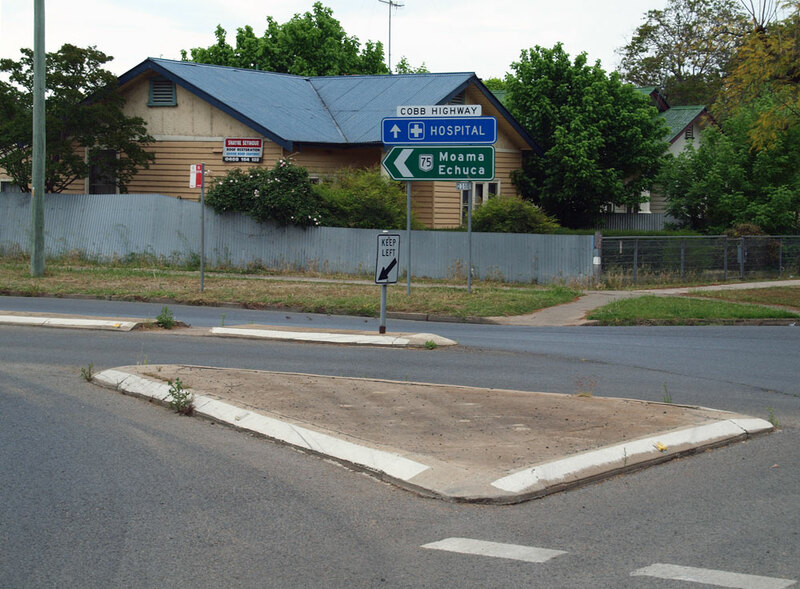 Two views of the junction of Cobb Highway & Lawrence Street at Mathoura. Note the dodgy signs - the top photo shows an all-capitals fingerboard and the bottom photo shows a dodgy NR75 squeezed onto the sign and a couple of dodgy stickers for the distances. 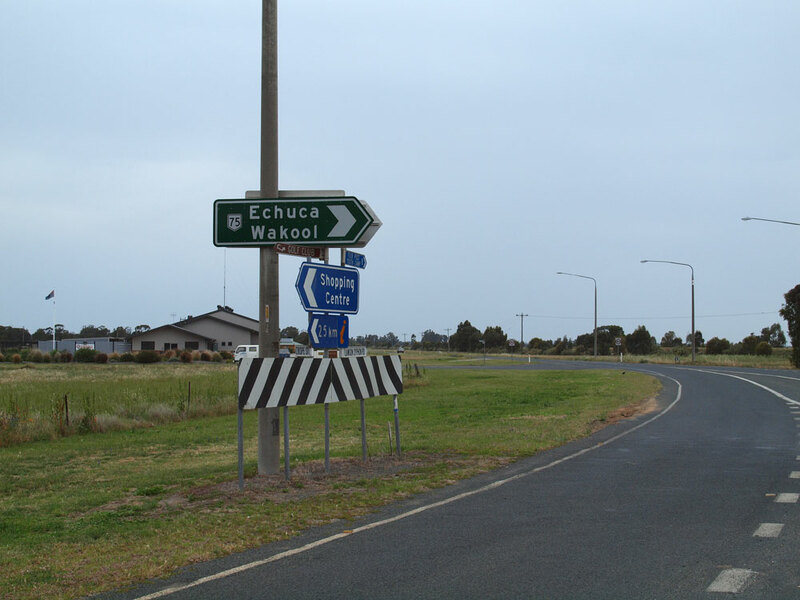 Old and new fingerboard signs at the junction of Cobb Highway & Walliston Road, 51km north of Moama. 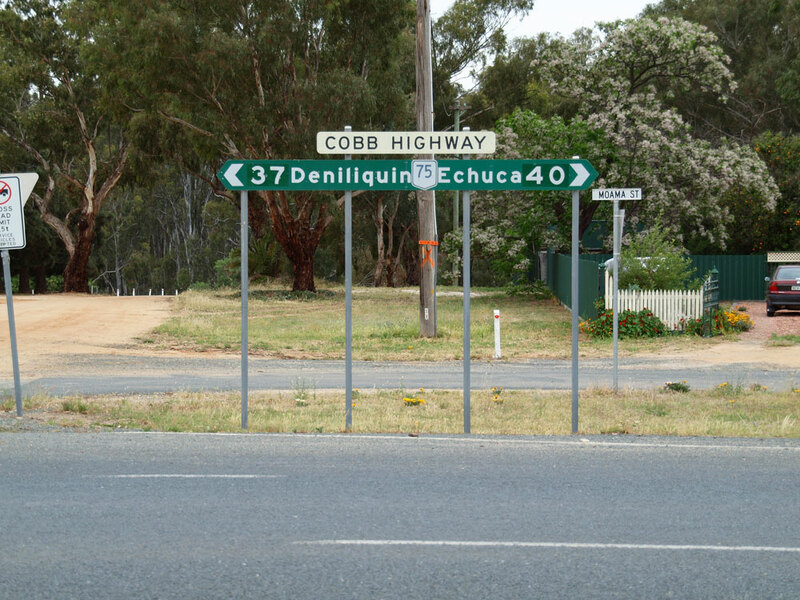 Note the sticker correcting the distance to Deniliquin - I can only assume this relates to the deviation which slightly lengthened the route of Cobb Highway through Deniliquin. Bottom photo: Peter Renshaw, October 2011. Old and new fingerboard signs on the other side of the same intersection. Note in the second photo that the Cobb Highway fingerboard has been replaced but the old black fingerboard for Gulpa Island remains. Cobb Highway looking south from the junction with Walliston Road, 51km north of Moama. Services signage northbound on Cobb Highway, 5km south of Deniliquin. These signs appear along many of the more remote highways to encourage travellers to take regular breaks and plan their journeys. 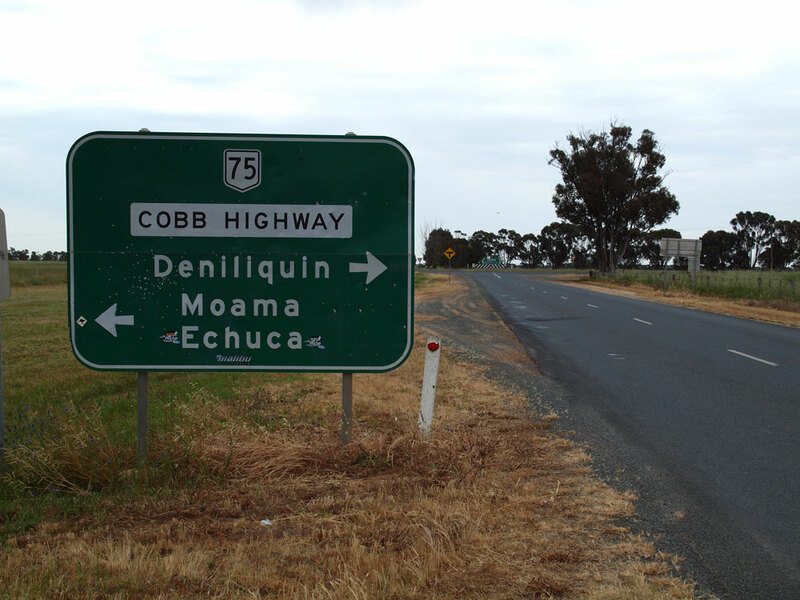 RD sign on Cobb Highway as you head south from Deniliquin. AD sign northbound on Cobb Highway approaching the junction with Saleyards Road on the southern outskirts of Deniliquin. 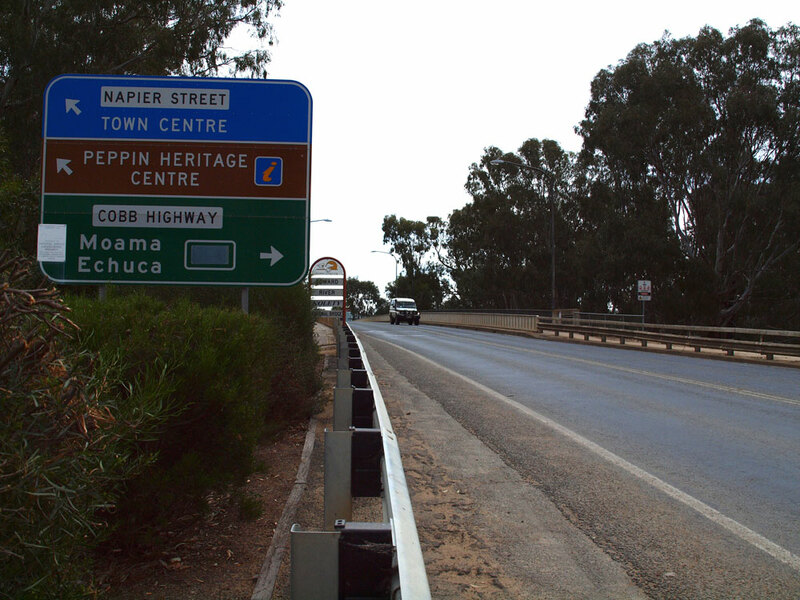 Old and new alpha-numeric-ready AD signs northbound on Cobb Highway approaching the junction with Cripse Street, Deniliquin. Note how the replacement sign has the through arrow incorrectly aligned and, more importantly, an incorrect B75 route marker with a gold border and the word 'NATIONAL' inside the shield. Not sure how this facepalm happened! Middle and bottom photos: Peter Renshaw, October 2011. 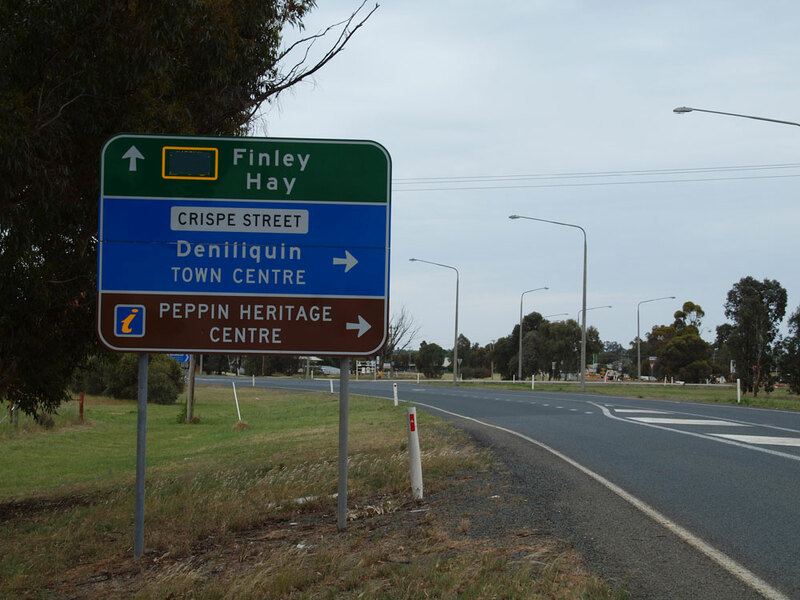 ID and fingerboard signs at the junction of Cobb Highway & Crispe Street, Deniliquin. 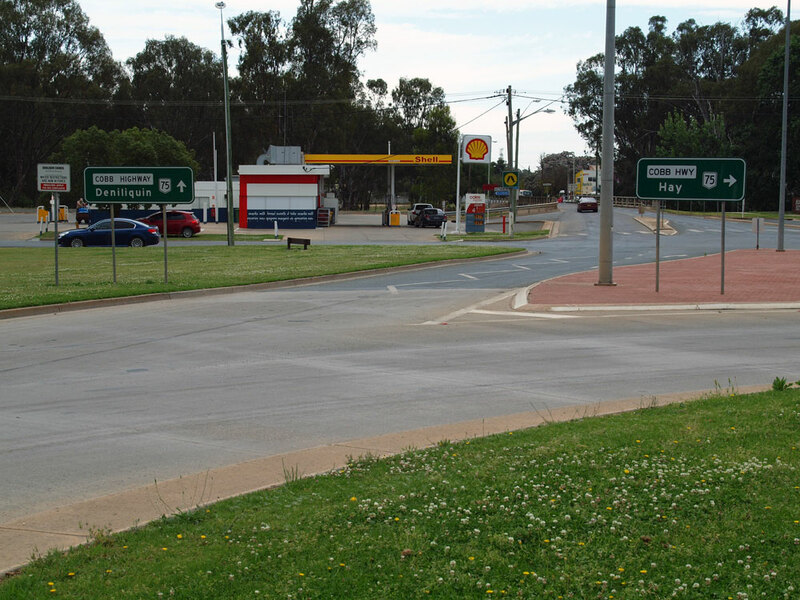 Crispe Street is the original alignment of Cobb Highway on the southern approach to Deniliquin town centre. Old and new AD signs southbound on Crispe Street approaching the junction with Cobb Highway. 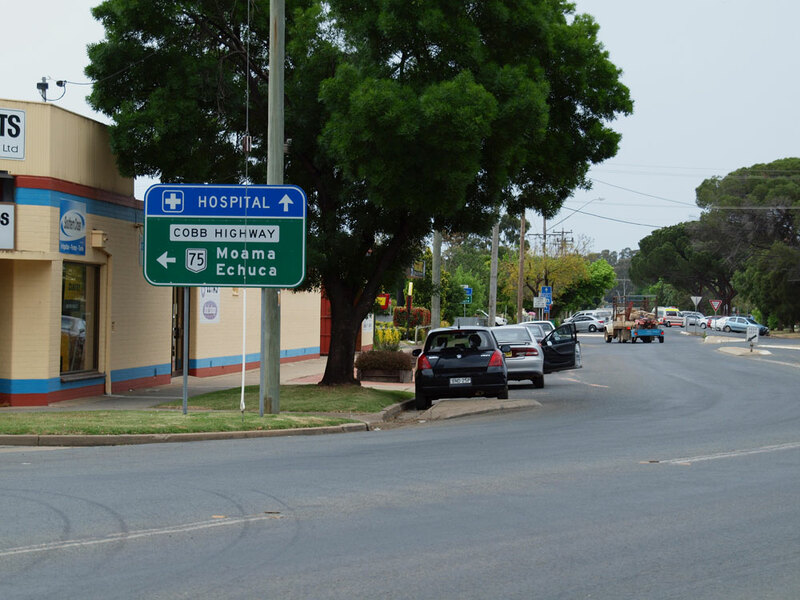 The sign in the top photo probably dates from the relocation of Cobb Highway away from Deniliquin town centre in the 1980s and was replaced by the horrible looking dodgy sign below. What a shame see to see these beautiful old signs replaced by such rubbish. Old and new ID signs at the junction of Crispe Street & Lawson Syphon Road, adjacent to the junction with Cobb Highway. This is another great example of beautiful old signs being replaced with utter rubbish! 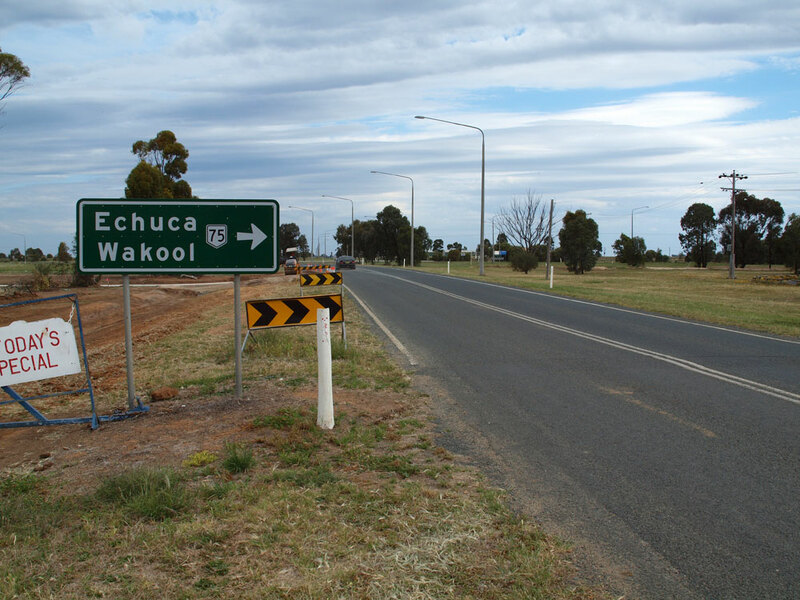 Also note the top sign has 'Wakool' on a coverplate - I wonder what was underneath it? 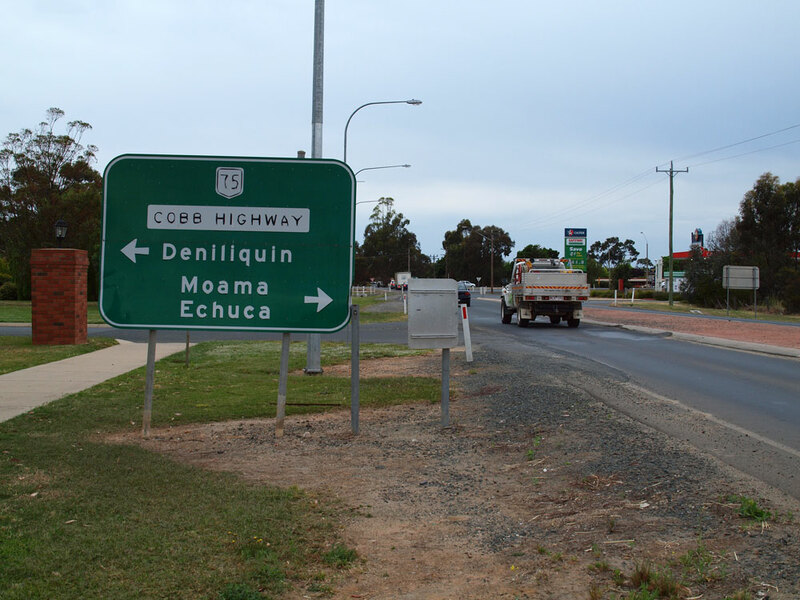 Sign assembly at the junction of Cobb Highway (Ochertyre Street) & Wirraway Drive, Deniliquin. Note the signposting of both the highway name and the local street name. RD sign facing southeastbound traffic on Cobb Highway (Ochertyre Street) near the junction with Hardinge Street, Deniliquin. 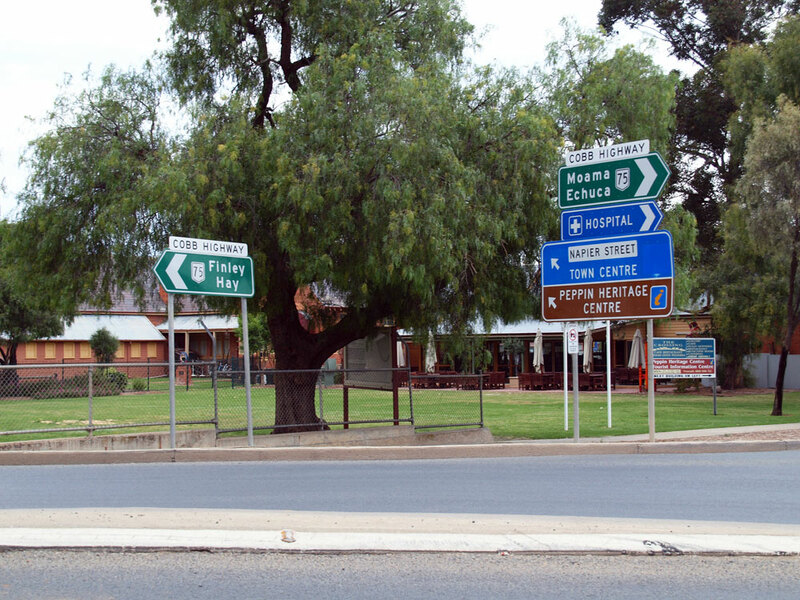 Old and new AD signs at the junction of Cobb Highway, Hardinge Street & Ochertyre Street, Deniliquin. Note the change in design from the diagrammatic style, which is being phased out, to the stack style. 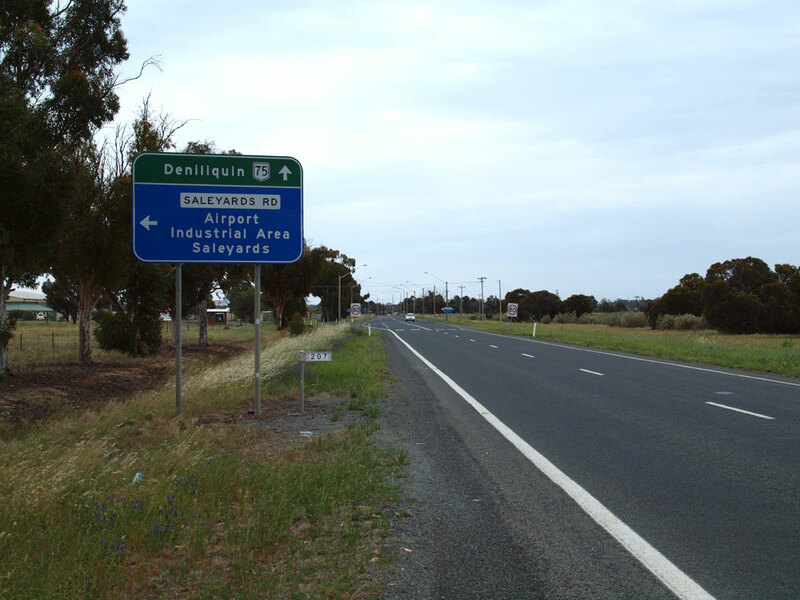 ID sign facing southeastbound traffic at the junction of Cobb Highway, Hardinge Street & Ochertyre Street, Deniliquin. 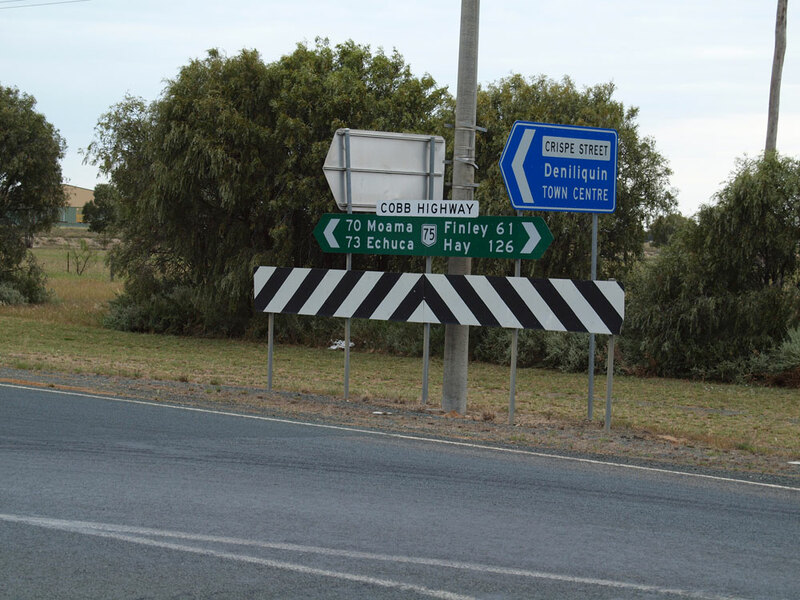 ID sign facing northbound traffic at the junction of Cobb Highway, Hardinge Street & Ochertyre Street, Deniliquin. 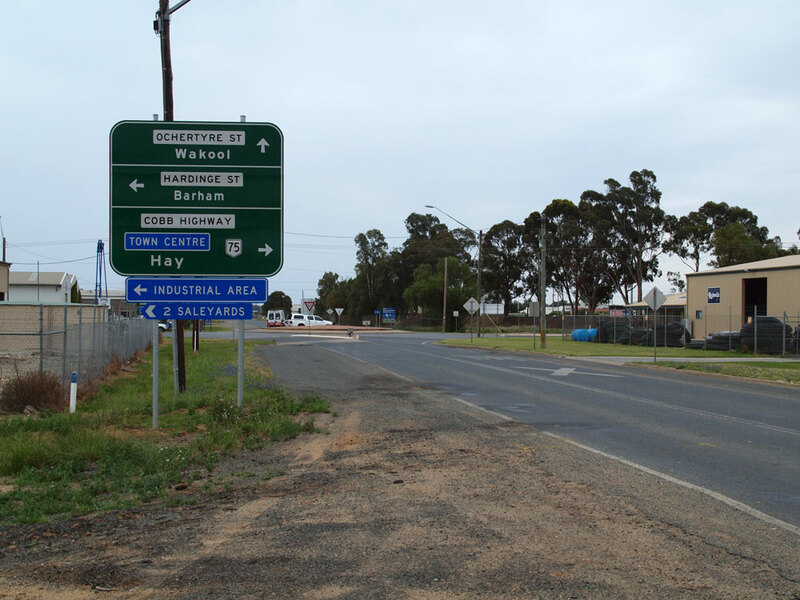 ID sign assemblies at the junction of Hardinge & Charlotte Streets, Deniliquin. 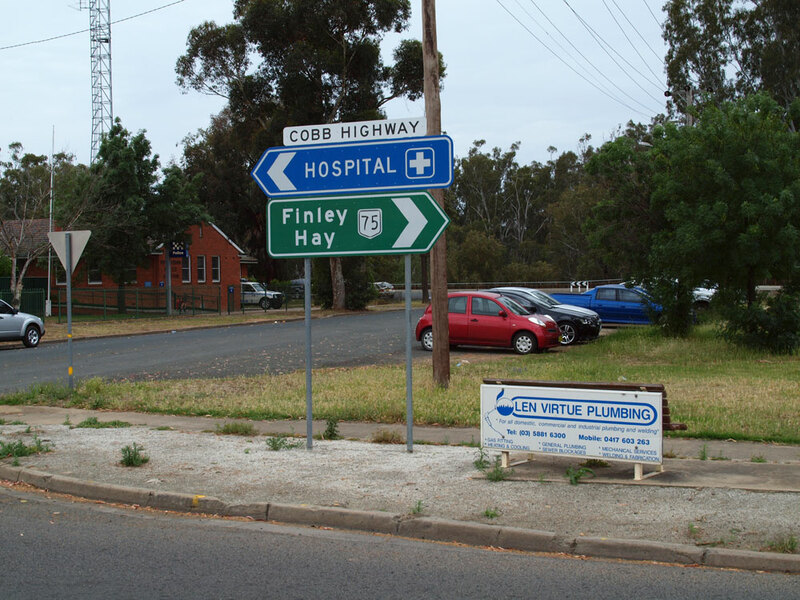 The 'Cobb Highway' name plates appear to be a late addition as they shouldn't be located above the 'Hospital' signs. AD sign westbound on Cobb Highway (Charlotte Street) approaching Hardinge Street, Denliquin. AD sign eastbound on Cobb Highway (Charlotte Street) approaching Napier Street where the highway rejoins the original alignment and crosses the Edwards River. Note the peeling black lettering. 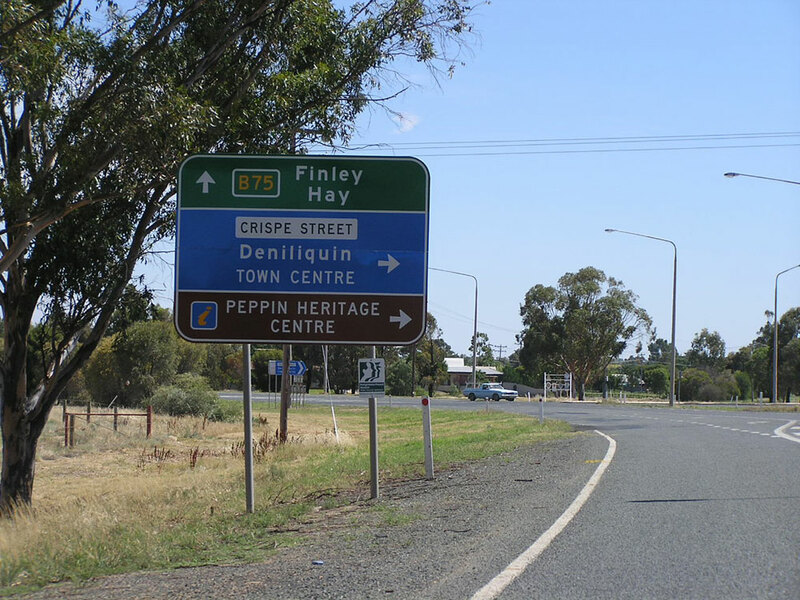 Sign assemblies at the intersection of Cobb Highway & Napier Street, Deniliquin. Note the newer sign referring to the town centre and Peppin Heritage Centre. AD sign southbound on Cobb Highway as you cross the bridge over the Edwards River. Note the blank coverplate which should, of course, show the NR75 route marker. 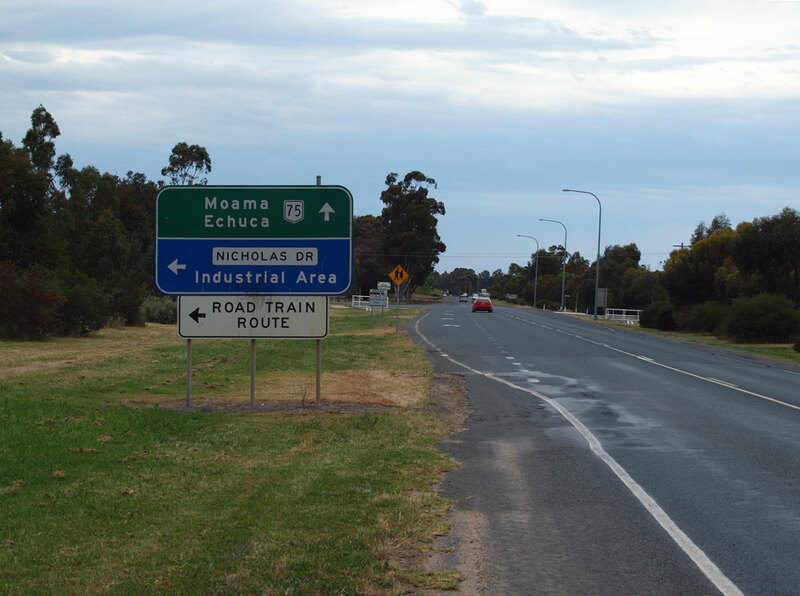 It is also disappointing to see Moama mentioned on this sign as it is not followed up on subsequent new signs! 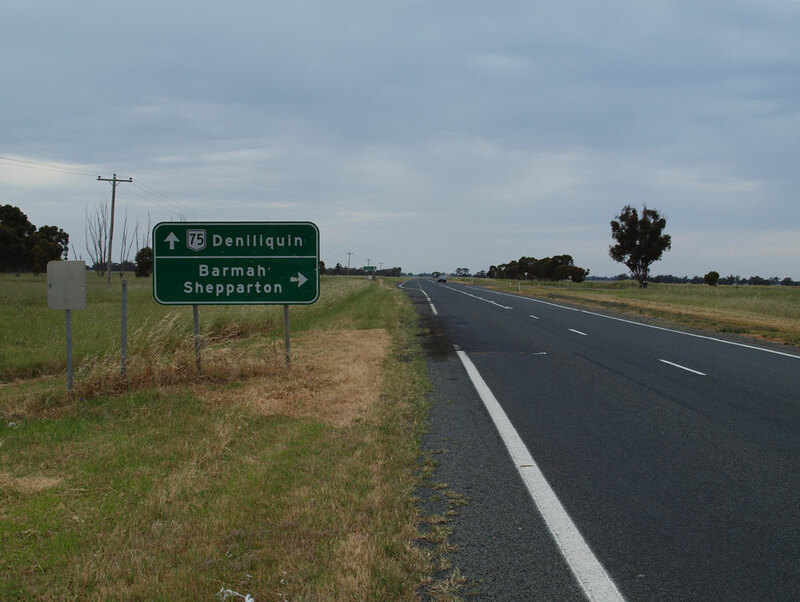 AD sign northbound on Cobb Highway (Davidson Street) approaching the junction with Riverina Highway, Deniliquin. 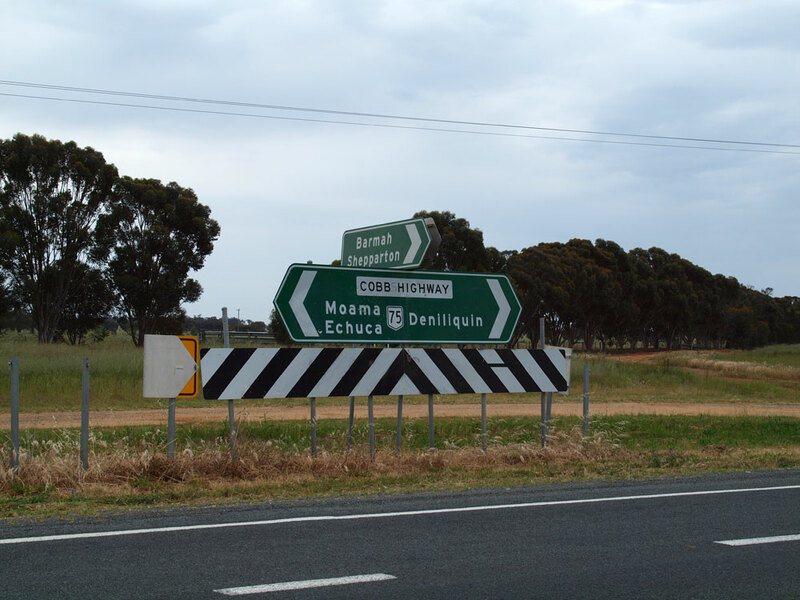 ID signs facing southbound traffic at the junction of Cobb & Riverina Highways, Deniliquin. Southbound approaching the Riverina Hwy. Jan 2005. 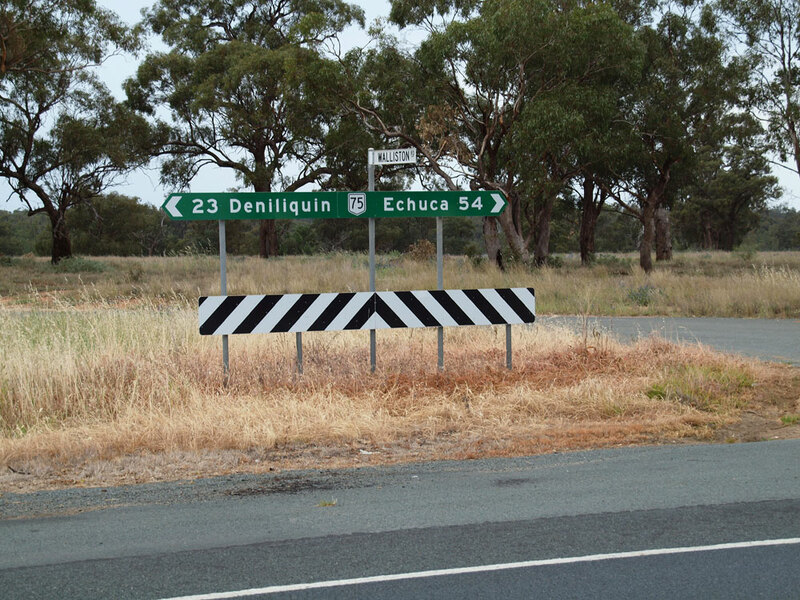 Very cool old black painted diagrammatic AD sign on the Deniliquin-Jerilderie Rd approaching the Cobb Hwy. Jan 2005. 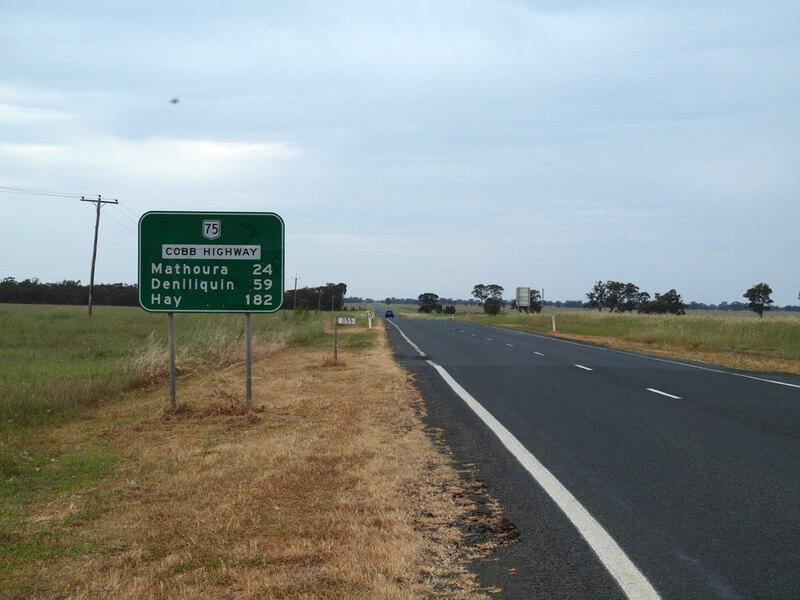 Another B75 sign heading north from Deniliquin. Jan 2005. 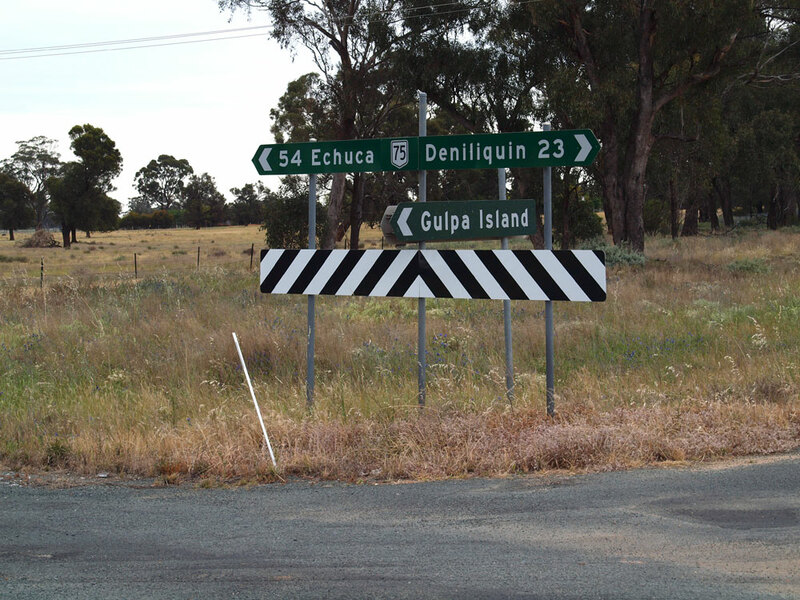 RD sign at the Moulamein turnoff, north of Deniliquin. Note the incorrect NH75 shield. Thanks to Jon Wilcox for providing this photo. Black fingerboard sign in Booboran, between Deniliquin and Hay. Photo taken January 2004. 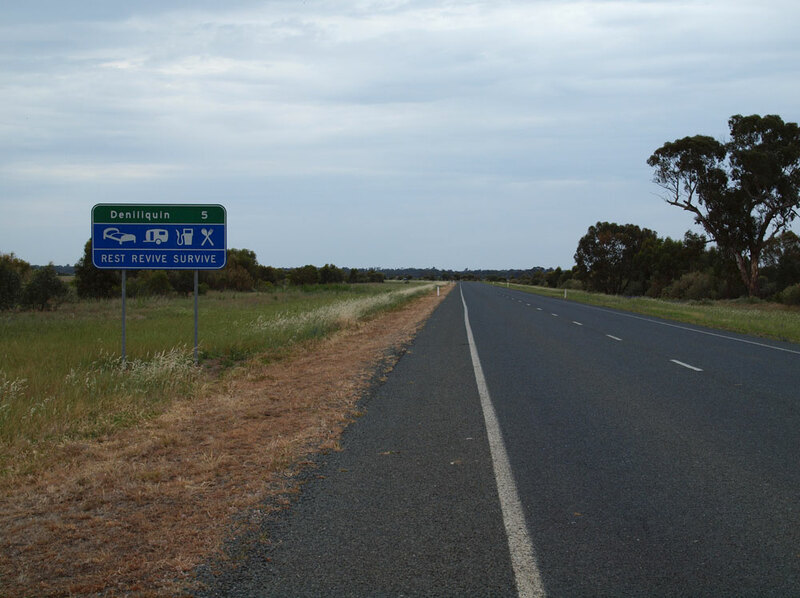 Distance sign southbound from the Sturt Hwy at South Hay. Photo taken January 2004. Northbound on Cobb Hwy approaching the northern terminus of NR24. Photo taken Jan 2004. Westbound on the Mid Western Hwy as it approaches the Cobb Hwy. Note the incorrect SR75 shield (should be NR75) and the coverplate with NH20 on it. My guess is a SR20 shield was under the coverplate. Photo taken Jan 2004. Southbound on Cobb Hwy, this sign shows all route numbers correctly (thank god!). Photo taken Jan 2004. Signs at the intersection gore. Note the incorrect SR24 shield and the NH20 which is on a coverplate. Photo taken Jan 2004. Same location, different perspective. Photo taken Jan 2004. Northbound RD sign on the Cobb Hwy leaving Hay. Note the absence of a NR75 shield (or a highway name for that matter). Photo taken Jan 2004. Northbound Cobb Hwy at Cadell St in Hay. One of the several NR24 shields placed off the actual route. Photo taken Jan 2004. Eastbound Cadell St at Cobb Hwy, Hay. No mention of NR75 to the left, althoug this is consistant with the rest of the route. Photo taken Jan 2004. ID sign at Cobb Hwy/Cadell St, Hay. Photo taken Jan 2004. 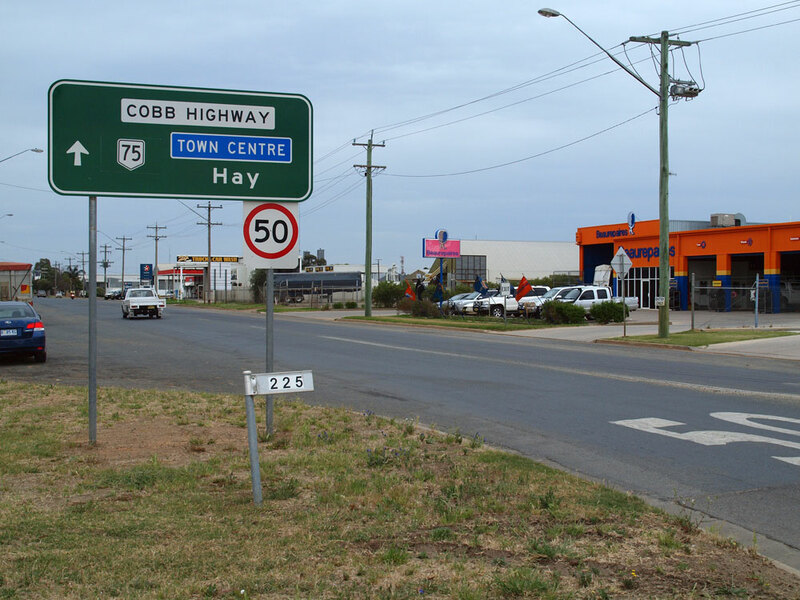 Westbound Sturt Hwy (NH20) approaching the Cobb Hwy (NR75) roundabout in South Hay. Note the use of a duplexed name and number for the right turn. Although technically incorrect, it does aid navigation between NR24 and NH20. Photo taken Jan 2004. Sturt Hwy in South Hay again, this time eastbound. Note the duplex for the left turn. Photo taken Jan 2004. 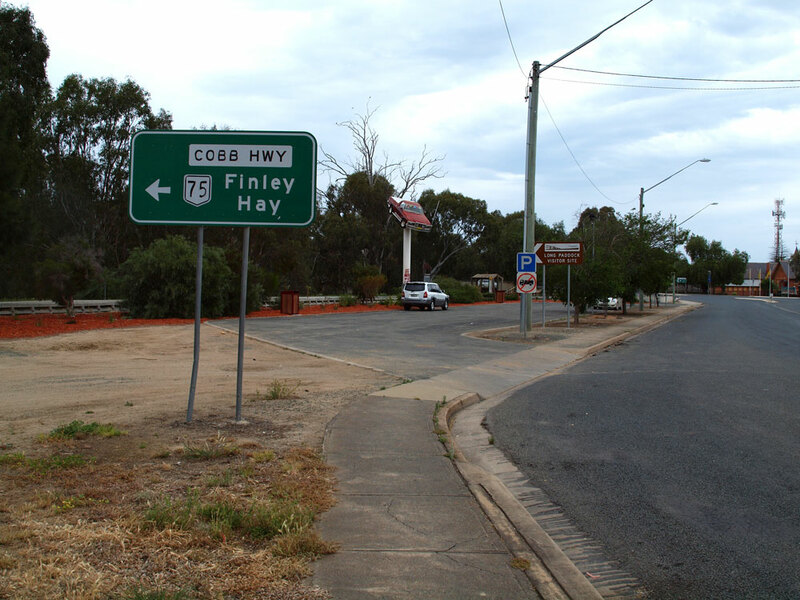 Cobb Hwy this time, northboudn approaching the Sturt Hwy in South Hay. Again note the duplex between NR75/24. Photo taken Jan 2004. Roundabout ID's showing the two highways and routes side-by-side. In this instance a 'To' prefix would work well. Photo taken Jan 2004. 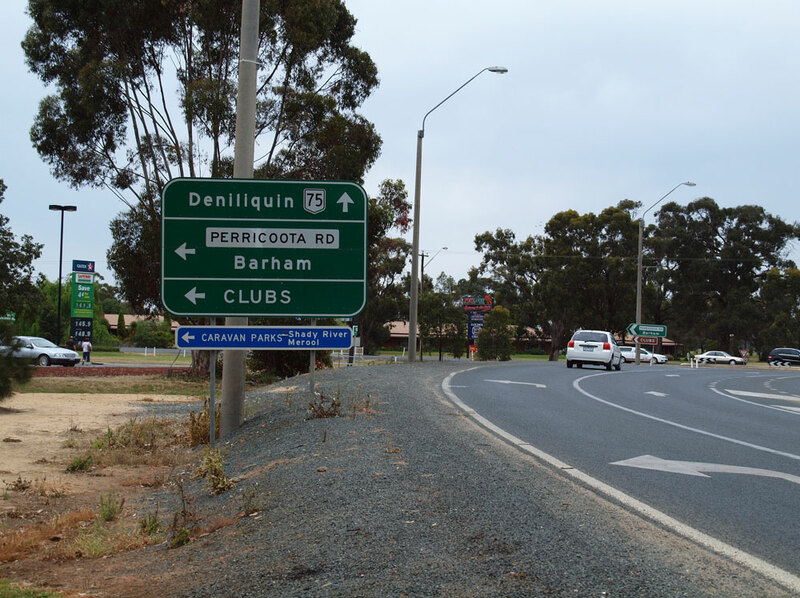 National Route 24/75 duplex on a distance sign heading north from the Sturt Hwy roundabout. Photo taken January 2004. Ivanhoe-Balranald Rd approaching the Cobb Hwy in Ivanhoe. Thanks to Jon Wilcox for providing this photo. Cobb Hwy & Ivanhoe-Balranald Rd intersection, Ivanhoe. Thanks to Jon Wilcox for providing this photo. Cobb Hwy, Ivanhoe. Note the incorrect NR21 shield, obviously the designer was confused between the Cobb's state highway 21 designation and its NR75 designation. Thanks to Jon Wilcox for providing this photo. Northbound Cobb Hwy approaching the Menindee Turnoff, north of Ivanhoe. 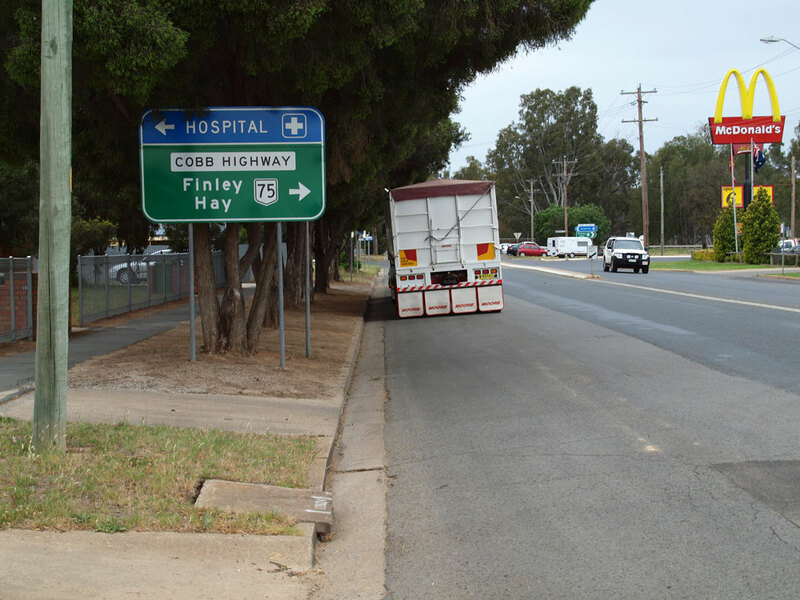 Thanks to Jon Wilcox for providing this photo. .
Cobb Hwy at Menindee turnoff. Thanks to Jon Wilcox for providing this photo. Fingerboard sign between Ivanhoe and Wilcannia on Cobb Hwy. Thanks to Jon Wilcox for providing this photo. Heading south from the Barrier Hwy. Jan 2005. The northern terminus of Cobb Hwy. Jan 2005. AD sign on the Barrier Hwy for Cobb Hwy. Jan 2005.